DETAILS: This stunning 3 bedroom plus bunk room, 3 1/2 bath Gulf Front condo has all the amenities a Watercolor home can offer. 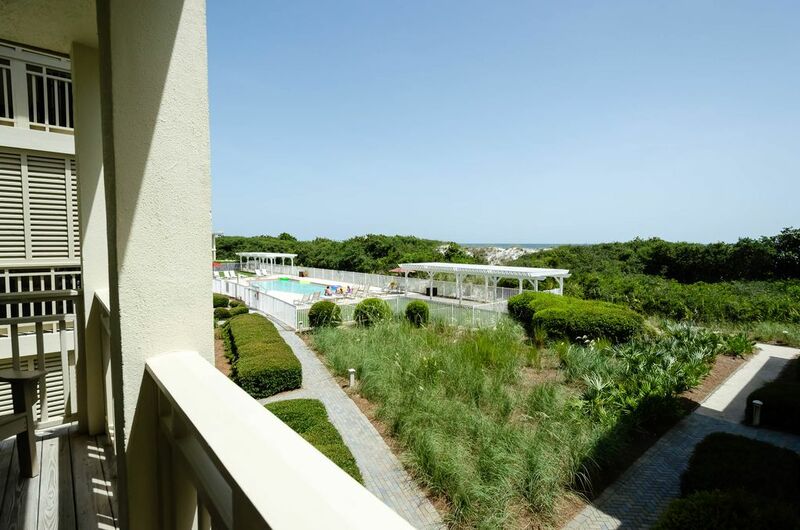 This condo is ideally located next to the Watercolor Inn, just a block to the private Beach club and quarter of a mile to Seaside. This 2 story condo is perfect for 2 families vacationing together. It accommodates large groups comfortably, the kitchen is fully equipped with the latest appliances, there is a wireless internet connection throughout the condo and flat screen TV's in every bedroom. Great property and great location ( can't beat closeness to the beach and pool!!). Price is great for 2 families, but a little expensive for just one. The only minor problem was the trash bin in the kitchen was full left from the previous guests. But overall was a great vacation for the family! My closest girlfriends and I had a great time staying at this beautiful property! The 9 of us had plenty of space and were close enough to walk to Seaside and the beach! We were only a 10 min drive from the grocery store too which was super helpful! We can’t wait to make this a tradition and come back every year! We are so glad that you had a wonderful girls trip with us in Watercolor! We agree that the location of these condos makes for a stress-free and fun getaway! We look forward to seeing you all again very soon! Bad things about Unit #4 is it really needs some attention and some work. Carpets are very dirty; hardwoods need some attention; shower in upstairs guest room has warm but NO hot water; couple receptacles do not work; curtain in guest bedroom sores in closet and curtain rod hanging on one side of window; ladder to upper bunk not secured and brackets dangling at top causing unsafe conditions; downstairs shower tile needs through cleaning and disinfecting; there are so many bicycles in the garage, that parking was cumbersome. (These bikes did not belong to the properties. They were rentals. About 10-12. They weren't used by anyone all week. Appeared as storage). Pool access cards simply DO NOT work at the pool gates but do work for beach access gate. (Not a new problem). Thank you for your valuable feedback on this home. We do apologize that it did not exceed your expectations. We have taken your feedback and notified the property manager to address all of these issues so they are being taken care of. Thank you so much for staying with 360 Blue and we hope to have you back again in the future! We go to Seaside every year with another family for a joint family vacation. This condo made it easy to put all the kids in one room (i.e., the large downstairs bunk room) so that they could spend quality time together. Seaside is just as beautiful as ever and this condo made our stay that much more enjoyable. Will definitely be back next year! We are so glad you enjoyed your time in Seaside so thoroughly and that the property could fit your needs so well! Seaside really is a gorgeous area, and we appreciate you choosing 360 Blue for your Seaside Escape! Come back and see us again soon! Our family had a wonderful time staying at beachside #4. We had 6 adults and 4 kids and it was perfect. Location couldn't have been better! Hi Carpenter Family: We are happy to hear you enjoyed your WaterColor vacation! Thank you for sharing your beach vacation with us! We hope you will come back and stay with us again in the future. Great location!!! Had a blast! What a beautiful photo! We are so happy to hear that you enjoyed your time here. We hope to have you back soon!